Idea about creation of Vindicta was born back in 2006. The translation of name of the band from Latin is vengeance or avenger. In 2005 I created band Approaching Inevitability together with another musician. I played the guitar and wrote lyrics, the second guitarist composed music. 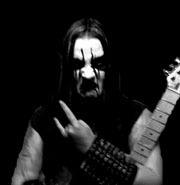 Less than year pass and the music starts to moving away from Black Metal, as music-kind and ideologic-king too. This causes big conflicts in the band. Then I realize to make all my own, so, Vindicta was create. I rejected searching of musicians, as most of them want popularity and possibility to gain money on music. I don't want to cooperate with such kind of persons. In the beginning the Vindicta's recording was made for companions-in-arms, but then, not logng ago, idea became to release this recording. Lyrical conception is Chaos, Darkness, Hatred, Descruction - all In The Glory of Him!!! The purpose of my music - to bring His Name!!! This is one of the options to praise Him!! !